Photo courtesy of Billy Graham Evangelistic Association. All rights reserved. You have probably heard the numbers that attempt to capture Billy Graham's impact on this world and the next. He has preached the Gospel to more people in live audiences than anyone else in history -- nearly 215 million people across more than 185 countries and territories. More than 3.2 million people have responded to the invitation at Billy Graham Crusades to accept Jesus Christ as their personal savior, and as of 2008, Graham's estimated lifetime audience, including television and radio, topped 2.2 billion. What you might not know is that, while the evangelist did not graduate from Baylor, the Graham family has strong Baylor ties. His daughter, Anne Graham Lotz, served as a Baylor Regent from 2005-08. Three of his grandchildren -- Jonathan Lotz, BA '94, Morrow Lotz Reitmeier, BSEd '96, and Rachel-Ruth Lotz Wright, BSEd '97 -- graduated from Baylor. Graham himself has been to Baylor and Waco on a number of occasions, including speaking in a Chapel service in 1950 and at a memorial service for victims of the May 1953 tornado that devastated downtown Waco. On Feb. 1, 1970, he was the featured speaker at a weeklong celebration of Baylor's 125th birthday. During his speech to more than 10,000 people at the H.O.T. Coliseum, Graham talked about the importance of Baylor's role in higher education and how the university's commitment to faith and learning helps students understand their responsibility to the world. "There is no reason for Baylor's existence as an educational institution without spiritual emphasis," he said. "That is one thing we've got that makes us unique. That is why there will always be a Baylor.... (A Christian institution) should give relevance to Christian faith through social concern. Blessed is the man who stands with the gospel of the Bible in one hand and social concern in the other." Ordained in 1939 by a church in the Southern Baptist Convention, Graham studied at Florida Bible Institute (now Trinity College in Florida) and Wheaton College in Illinois, where he met and married Ruth McCue Bell, daughter of a missionary surgeon. 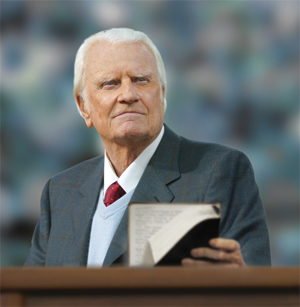 The author of 30 books, Graham founded the Billy Graham Evangelistic Association in 1950, headquartered in Charlotte, N.C. Graham has been listed by the Gallup organization as one of the "Ten Most Admired Men in the World" an unprecedented 55 times, including 49 times consecutively. His counsel has been sought by every president from Eisenhower to Obama, and his appeal in both the secular and religious arenas is evidenced by the wide range of groups that have recognized him, including an honorary doctorate of divinity from Baylor on Nov. 6, 1954, when Graham spoke at Baylor's Second Annual Conference on American Ideals. "We need an institution like Baylor University that trains young men intellectually, but does not forget the spiritual, development of a soul. And Baylor more than any institution I know in the United States has taken knowledge and the intellectual in one hand and the spiritual in the other, and is developing Christian leadership in America unparalleled at the present moment." In early September 2012, a small contingent of Baylor representatives had the rare opportunity to visit Billy Graham in his log cabin home in the mountains near Montreat, N.C. There to present the greatest evangelist of our time with Baylor's Pro Ecclesia Medal of Service were Board of Regents Chairman Richard S Willis, BBA '81, MBA '82, Regent Ramiro Pena, BA '88, Vice President for Constituent Engagement Tommye Lou Davis, BA '66, MSEd '68, and Baylor photographer Robbie Rogers. The group was welcomed by four of Graham's children, Franklin, Ruth, Gigi and Anne, and by granddaughter Morrow. "We had a true mountaintop experience, literally and figuratively," says Davis. "The four of us felt we were on holy ground." Davis says that the visit with Graham held a lifetime of memories in which Graham spoke about a book on salvation that he's about two-thirds finished writing and reminisced about his relationships with Baylor and with spiritual leaders who have hailed from Texas, such as George W. Truett. "He appreciated the fact that Baylor had remained true to her Christian mission, seemed pleased that three of his grandchildren had come to Baylor and loved Baylor so much, and said he hoped that other children in the family (great-grandchildren) would attend Baylor," says Davis. "The Pro Ecclesia Medal of Service provided Baylor the opportunity to honor Rev. Graham, whose contributions to Christian ministry have made an immeasurable impact upon our global community, Baptist life and Baylor University," Davis continues. "With more than 2,000 undergraduates on our campus who have indicated an interest in vocational Christian ministry and the number of Baylor discipline-specific mission teams who spread out around the world growing annually, we honor Reverend Graham for providing a wonderful example for this generation to follow."